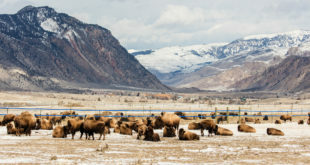 From heat-loving microscopic microbes to the big lumbering beasts such as bison and bears, the Greater Yellowstone Ecosystem is world-famous for its plant and animal life. When you ask visitors what was it about Yellowstone that they found the most interesting, more often than not the first in the list is animals — not geysers. In the developed world where people, especially young people, have little or no contact with wild animals, the experience of seeing animals behave in their natural habitat can be thrilling. To know that the bear by the river is not only live (not film, not TV, not a graphic in a game), but that it catches and eats fish right there in front of you (at a safe distance, of course); that’s really special. The plants and animals of Yellowstone Park are part of a much larger ecology: the Greater Yellowstone Ecosystem. This is a contiguous area in the states of Wyoming, Montana, and Idaho of over 18 million acres, roughly the size of the state of West Virginia. It’s comprised of systems of mountain ranges, high plateaus, lakes, rivers, and river valleys that are still mostly wild and contain almost the same plants and animals that were there thousands of years ago. Most of the area is under some kind of federal jurisdiction: National Parks, National Forests, National Wildlife Refuges, and National Wilderness Areas. Some of it is human inhabited and used for ranching, farming, and tourism. At its heart is the active Yellowstone volcano, which produces some habitat that is extremely rare. All together, the Greater Yellowstone Ecosystem is one of the largest, relatively intact temperate zone ecosystems left on Earth. The distribution of plants and animals varies throughout the ecosystem. Altitude and climate, often related, play a big role. In very rough terms, the ecosystem has three layers by altitude: Alpine zone (the high mountains and plateaus), middle coniferous (pine tree) zone, and low semi-arid river valley zone. Plants follow the climate limitations the most closely, with deciduous (leafy) trees and sagebrush in the lower river valleys, pine forests in the middle altitudes, and tundra plant species in the alpine zone. Some animals stick more or less to these zones, mountain goats for example, are almost exclusively in the alpine zone; but many animals have settled throughout the area, and many of the larger animals — bison, elk, deer, and antelope — migrate from one zone to another depending on the season. The migrating herd animals are the ones most people are likely to see, especially bison. These magnificent shaggy beasts can be found almost anywhere in Yellowstone Park, including the middle of the road. Elk are also common, especially in spring, late fall and winter. Some of the other large grazers — moose, deer, antelope, mountain sheep — are more localized and less commonly seen. Everybody’s favorites are the famous park predators: Bears (grizzly bear and black bear) have long been almost a symbol of the park, although after a decades-long program to limit the bears’ exposure to humans (and human food); they are no longer a common sight. Wolves are the new favorites, although even more than bears, sighting a wolf typically in a pack requires some effort and planning. Many of the other predators –- coyotes, lynx, mountain lion, and the great raptors (bald and golden eagles) — are more solitary. Coyotes can be seen along the road but the others are much harder to spot. 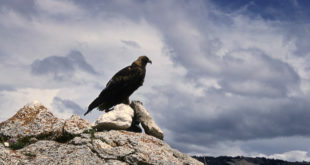 Speaking of spotting, animal spotting is becoming a major activity in Yellowstone, with thousands of people coming each year to set up cameras and spotting scopes in favored locations (Lamar Valley, Antelope Ridge, Hayden Valley) and spend whole days scanning for birds and wildlife. In summer, birders (bird watchers) can find a fair number of species, including the rare trumpeter swan. Because of the plentiful lakes and large streams, aquatic birds are common and easy to see even from the roads. Forest and alpine birds usually require some hiking, although many species can be seen in the vicinity of campgrounds and picnic areas. Where there’s water, there’s almost always fish, although many lakes and streams in the Greater Yellowstone Ecosystem were barren of fish until man started to plant foreign species around 1900. The native fish of the area are the cutthroat trout and the western trout, both marginally endangered within this range. Lake trout, illegally introduced into Yellowstone Lake, are decimating the cutthroat trout population, which is in turn an important food supply for bears, pelicans, eagles, otters, and others. This is an example of how interrelated the species can be within the ecosystem. Other non-native species found in the region are whitefish, brook trout, rainbow trout, brown trout, and grayling. Although still one of the most-storied and best sport fishing regions in the United States, catch-and-release (no keeping of fish) is now the general rule, especially within the park. The newest members of the Yellowstone environment to be appreciated by us humans are, in fact, among the oldest living things on earth — the bacteria that live in the thermal waters of the park. Although it’s been known for a long time that many of the park’s hot springs, geyser runoffs, and thermal pools contained algae and perhaps bacteria, it was not until the second half of the twentieth century — after 1950 –- that it was realized algae and especially bacteria thrived in the hot waters. That most of the color people see in thermal water, such as Morning Glory Pool, comes from bacteria. In fact, some of the species are extremophiles that live in water near the boiling point in temperature. Within a few decades the study of thermophiles, heat-loving bacteria, has become an important part of Yellowstone science, and has made notable contributions, for example to the development of DNA testing. It continues to be a study that is helping us understand just how diverse and hardy life can be. A little perspective: the diversity of Yellowstone’s animal life is characteristic of northern climates, but should not be compared to jungle life, or even the diversity of life in somewhat similar ecosystems such as the African plains. Yellowstone has about 55 species of animals; the Serengeti in Africa has hundreds, and the Amazon jungle thousands of species. What may help make Yellowstone’s ecology so fascinating to tourists as well as scientists is its relative accessibility — the animals in Yellowstone are, mostly, quite visible, even for casual human observation. Also, while the ecosystem is diverse and at times puzzlingly complex, it’s not so complex that people are reluctant to analyze it. Put another way, Yellowstone has an unusual aggregation of life in a location where it’s relatively easy to see and study — and that fascinates us. It is also, from several points of view, a national and global treasure.